Stylized Indian décor and stylish nouveau Indian food in Cleveland Park. Lunch Fri.-Sun., Dinner nightly, Brunch Sun. : A flashy and upscale eatery, Indique (unique Indian) puts a contemporary spin on traditional Indian cooking, using arty ceramics, stylized food presentations and minimalist portions, some available tapas-style. Even the décor --- an upstairs dining room with tables arranged around an open central well in the floor for an upstairs/downstairs effect --- is understated and almost stark. The menu is fanciful, thanks to the creativity of chef K.N. Vinod, who takes Indian flavors and textures and melds them into something new, such as his achari chicken paratha done as a taco or the lobster-shrimp bisque with coconut and curry leaves as starters. 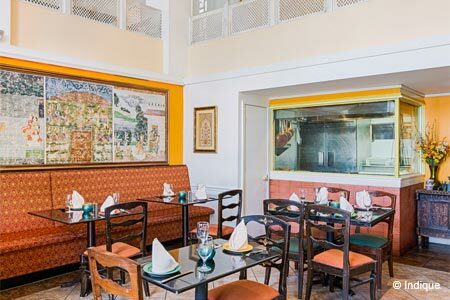 Tandoori items and curries are outstanding, and Vinod offers some of the dishes from his hometown, like the Kerala shepherd's pie; also enjoy the braised lamb shank or the just-fiery lamb vindaloo. You can go vegetarian with options from roasted eggplant to the cubes of homemade paneer. Indique’s cocktail list is eclectic and exotic. Sip on drinks such as the Mumbai Mule, Garam Masala Tonic and House of Cardamom for a hip experience. Ask about the wine pairings, too, perhaps the Good Karma Riesling. End the meal with mango cheesecake or the rather unique mustard mango chili caramel sundae. Want an Indian brunch? Try the assorted cocktails and loads of unique breakfasty items.